Sweet ten minute film plays like a condensed feature. Thats a good thing and a bad thing. Its a good thing because we get the full grasp of what a feature version of the film would be, but it's bad because the emotional connections that should be there are only hinted out. This is a story that were it to be lengthened to a full feature would probably be breaking people's hearts the world over. 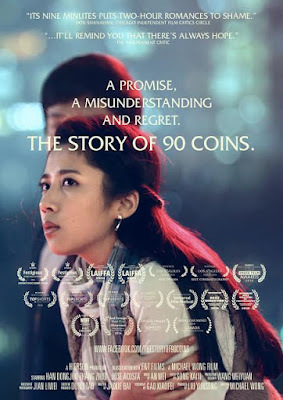 To be honest I think Mr Wong has a great sense of story telling, however he has one small flaw that carries over to 90 COINS and that is the film looks and feels like a TV commercial. While this is great for compact story telling there is a sheen to the filmmaking that keeps us distanced. You feel watching the film that a product tie in is going to pop up at any moment. That said. I think that someone should give Mr Wong enough money and let him turn his short film into a feature. He has the talent. He has the eye and he has one hell of a story to tell. If he can lose the TV commercial feel I think that Michael Wong will turn into a truly great director. As for THE STORY OF 90 COINS its a really good film and worth your time if you run across it at a local film festival or on line. Here is the Facebook Page for the film.